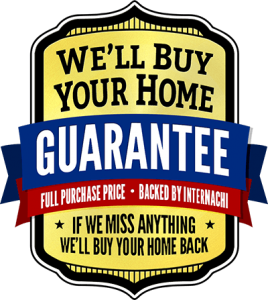 If you are not completely satisfied by the end of your home inspection we will refund your inspection fee! We are so sure that you will love our service and our professionalism that we’re willing to give you this pledge! How many home inspectors in the Indianapolis area do you know who are this confident in their work? How many companies offer what we do and care this much about your satisfaction? All parties must be present during the entire inspection. I must be inform by the end of the inspection that you are not satisfied. You must continue to purchase the home. You must have incurred the expense of another home inspection on the same home. Refunds will be given in the form of a company check within 30 days with a paid receipt for another home inspection and with proof of closing on the home inspected. The purpose of this warranty is to provide the client with repair protection for a period of ninety (90) days from the date of the inspection on those components that were inspected and listed in the report as functional. This warranty is provided for complete home inspections only and does not cover construction phase inspections, one-year warranty inspections, re-inspections or partial inspections. This limited warranty does not modify, replace or eliminate the INSPECTION AGREEMENT signed by the client or the client’s agent at the time of the inspection. The limited warranty is in addition to the INSPECTION AGREEMENT. Any concerns or conditions which arise after the time limits set forth in this limited warranty will be handled as per the conditions agreed to in the INSPECTION AGREEMENT. A signed acceptance of the INSPECTION AGREEMENT OR ACCEPTANCE OF THE INSPECTION REPORT is hereby acceptance of the terms and conditions of this limited warranty. The warranty is not designed to cover normal maintenance items or to be a replacement for existing insurance coverage. The coverage is for single family or condominium residences only. NO coverage is provided while the current owner occupies the home. The warranty will cover those items inspected at the time of the inspection and were deemed functional AS PER THE WRITTEN INSPECTION REPORT. If a client finds a component, which is covered in this limited warranty, non-functional within the time frame mentioned above, CRAWFORD HOME INSPECTIONS LLC agrees to reimburse the client the cost of the repair up to the designated limits. If an item is not fixable CRAWFORD HOME INSPECTIONS LLC will reimburse the client the maximum amount allowed for that component repair cost limit. Any and all building code violations at the time the home was built or the time new equipment was installed that do not cause the component to be non-functional are NOT part of this limited warranty. All items in the report listed as areas of concerns will NOT be covered unless those items are repaired and then re-inspected by Crawford Home Inspections LLC for a separate fee .Only those items listed below are covered in this limited warranty. Any components on the inside or the outside of the home, which are currently in a class action suit because of manufacturer’s defects, are not covered in the limited warranty. CRAWFORD HOME INSPECTIONS LLC AGREES TO PAY A MAXIMUM OF $5000.00 PER LIMITED WARRANTY OF TOTAL CLAIMS RECEIVED FOR THIS PROPERTY DURING THE SPECIFIED TIME FRAME. THE MAXIMUM AMOUNT OF REPAIR COST OR REPLACEMENT COST TO ANY ONE COMPONENT WILL BE LIMITED TO THE STATED AMOUNTS LISTED BELOW. CENTRAL HEATING The heating equipment must be less than ten(10) years old. The HEAT exchangers are not fully visible and, therefore, are not part of this coverage. Damaged duct pipes are not covered. Any item or part of the heating system which will not respond to the control settings and not provide warm air to the designated area, is covered. The vent pipe and overflow devices are covered. ANY PHYSICAL DAMAGE WHICH OCCURRED TO THE EQUIPMENT AFTER THE ORIGINAL INSPECTION IS NOT COVERED. The repair cost is limited to $700.00. CENTRAL COOLING The cooling equipment must be less than 10 years old. Any item or part of the cooling system which will not respond to the control settings and does not provide cool air to the designated area are covered. Condensation pumps are not covered. The repair cost is limited to $700.00. ROOFING Only roofs with a 2 on 12 pitch or greater will be covered. The roof covering materials are to be less than 10 years old. The coverage is to provide for the repair of any active roof leak missed at the time of the original inspection. Roof shingles and flashings are not covered. Damaged or defective roof framing members not reported at the time of the original inspection will be covered. Under no circumstances will the limited warranty be responsible for replacing an entire roofing system. The repair cost is limited to $500.00. INTERIOR PLUMBING Leaks in the water and drain lines within the confines of the home will be covered. Because drain lines can stop up suddenly, stoppages in drainlines are not covered. Whirlpool bath motors and pump assemblies are not covered. Water heaters less than five years old are covered. Dripping faucets, defective drain stoppers, cosmetic conditions to tubs, toilets, sinks, tub enclosures, and shower enclosures are not covered. Lack of or missing grout or caulking which result in leaks is not covered. Poor water pressure is not covered. Sump or lift pumps located in basements or crawl spaces are not covered. The repair cost is limited to $500.00. ELECTRICAL SYSTEM The electrical system must be less than fifteen(15) years old. The main electrical panel box, circuit breakers, and ground fault circuits are covered. Light switches and wall receptacles are not covered. The door bell, light fixtures, ceiling fans, alarm systems, inadequate wiring systems, sensors, relays, low voltage systems, garage door openers, and timed circuits are not covered. Buss fuses in service panels are not covered. Light switches and wall receptacles concealed from the home inspector for any reason at the time of the inspection will not be covered. The repair cost is limited to $500.00. KITCHEN APPLIANCES The appliances covered must be less than ten(10) years old. The dishwasher (must be less than two(2) years old), oven, cook top, and vent hood are all covered. Knobs, timers, lights, handles, glass doors, racks, rollers, rotisserie, meat probes, washers, dryers, disposals, microwaves, icemakers, and refrigerators plus their electrical and water hookups and drainlines are not covered. The repair cost will be limited to $300.00. EXTERIOR OF THE HOME Rotted wood on the exterior siding, door trim, window trim, and fascia and soffit boards greater than twenty(20) square inches in any one given location will be covered. Any wood damage regardless of the size or location caused by termites and any water damage that was concealed at the time of the original inspection will not be covered. Any water damage, causing swelling along the bottom edges of the siding and at joints are not covered. Hairline cracking in brick walls and concrete stucco walls are not covered. Synthetic stucco siding will not be covered. This type of siding inspection should fall under a separate moisture inspection. The gutters are covered provided that they are less than six(6) years old. The repair cost will be limited to $500.00. FOUNDATION WALLS Poured in place concrete and concrete block foundation walls are covered only to the extent that their load bearing ability is affected. Water entry into basements, garages, and crawl spaces is not covered. Cracks in foundation walls are not covered. The repair cost will be limited to $700.00. DECKS AND DECK STEPS The deck must be less than ten(10) years old. Loose deck boards, loose steps, splitting wood, and loose handrails are not covered. The repair cost will be limited to $300.00. CLAIM PROCEDURES Prior to any repair work, CRAWFORD HOME INSPECTIONS LLC must be notified in writing to the corporate office at 2230 Stafford Road Suite 115, Plainfield, IN 46168, and a company representative must inspect the component before any repair work is authorized. A company representative will arrange the inspection within three business days of notification to the company. There will be a $65 service charge or the actual fee, whichever is less, each time a claim is made, paid by the CRAWFORD HOME INSPECTIONS LLC client. This fee will be paid directly to CRAWFORD HOME INSPECTIONS LLC at the time of the re-inspection and is non-refundable if repair work is not needed. CRAWFORD HOME INSPECTIONS LLC will then reimburse the client for the repair cost up to the set limitations. The client is responsible for arranging access to the property and scheduling the repair work to be completed. The client will be responsible for opening up, closing, refinishing, and decorating any surfaces before and after the repairs are made. In the event repairs are completed without proper notification to CRAWFORD HOME INSPECTIONS LLC and without re-inspection by CRAWFORD HOME INSPECTIONS LLC, all claims pertaining to this limited warranty are waived. CRAWFORD HOME INSPECTIONS LLC does not warrant any repairs made and does not assume any responsibility for the quality, workmanship, or any consequential damage caused by a repair person or vendor and/or any damage to the home caused as a result of a component being non-functional. IN THE UNLIKELY EVENT THAT A DISPUTE ARISES BETWEEN THE CLIENT AND CRAWFORD HOME INSPECTIONS LLC AS TO CRAWFORD HOME INSPECTIONS LLC’S LIABILITY UNDER THIS LIMITED WARRANTY, SUCH DISPUTE SHALL BE SETTLED BY ARBITRATION THROUGH THE BETTER BUSINESS BUREAU OF INDIANAPOLIS.